The Candy Kingdom’s not so sweet for bakers like you. People need cakes, and they don’t care where they get ‘em. Are you willing to risk the ire of the Gumball Cops and the Cake Syndicates to make yourself a bit of scratch? Sell out your friends? You can get away with a little… but not for long. 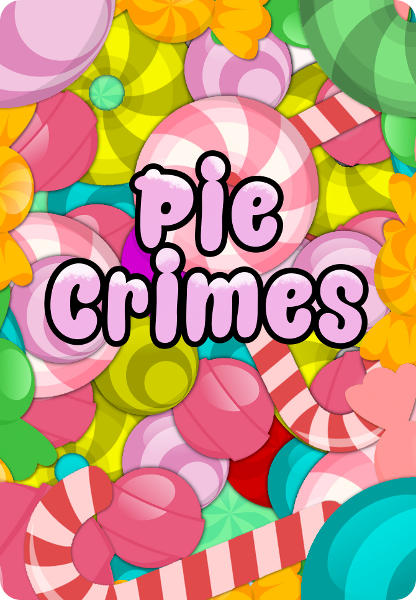 Pie Crimes is a player-versus-player cooperation-and-competition game for two to six players with an educational undercurrent and a candy-coated aesthetic. Players play to a fixed goal and don’t need to be able to read a lot of text to play. A copy of Pie Crimes comes with pie and score cards for six players, a deck of newspaper cards for scoring, and two facing cards to make the deck look nice. Pie Crimes requires minimal shuffling, but does require some table space so players can place cards face-down. Players may use their thumbs to track failures, and players who cannot should be given some alternative way. Want to Buy Pie Crimes? For international customers, you may prefer to buy print-on-demand via DriveThruCards (the same printer we use for our local stock). You can buy Pie Crimes at DriveThruCards as a professionally printed card deck. Already bought Pie Crimes? Download the latest revision of the Pie Crimes rulebook. You can also follow us to receive notifications of rules updates!